Bob Mulliman, a MuggyWeld.com customer, traveled 200 miles to attend an antique car show, hoping to restore his irreplaceable 1940 Ford belt buckles. Bob first approached the “pop can” repair stand, and was not only turned away, he was told “it’s impossible, it’s pot metal, it cannot be repaired” and encouraged to throw away the buckles and buy new ones. 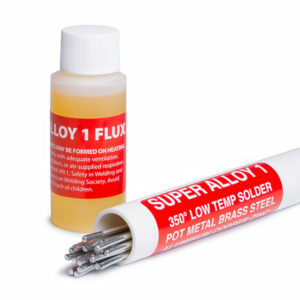 After speaking to Mike at MuggyWeld.com, Bob easily made this “impossible” repair with Super Alloy 1 and a propane torch.